EDITOR’S NOTE: To Watch Saturday’s action on ESPN & The WatchESPN App, go HERE> Broadcast schedule posted below. The R48 IV Stop #4 and WR48 II Stop #2 kicked off on Friday with the R48 qualifier and R48 round of 16 play on Friday in the Paris of the West. Abraham Montijo entered the qualifier as the top seed and cruised to a spot in the main draw with a dominating victory over Canada’s Ryan Bowler. Ireland’s Stephen Cooney qualified for the fourth straight event, overcoming a 14-15 halftime deficit against rising star Anthony Sullivan to win, 25-15. Vic Perez, Erik Torres, Luis Cordova, Daniel Cordova, Martin Mulkerrins and Anthony Selestow joined Montijo and Cooney is the main draw after easily advancing in their respective qualifier finals. Catriona Casey (Women’s #1) attempted to qualify for the first time in the men’s division, but fell short in her opening round; losing 21-25. Casey, in great spirits after the match was seen reffing, helping tournament control and playing two-bounce w/locals (plus former WPH #1, Luis Moreno) as the day wound down. Paul Brady needed just 14 minutes to dispose of Tucson’s Abraham Montijo, cruising to a 15-0, 15-4 victory. Brady will face Sean Lenning in tomorrow’s quarterfinals in a rematch of the R48 IV Houston finals. 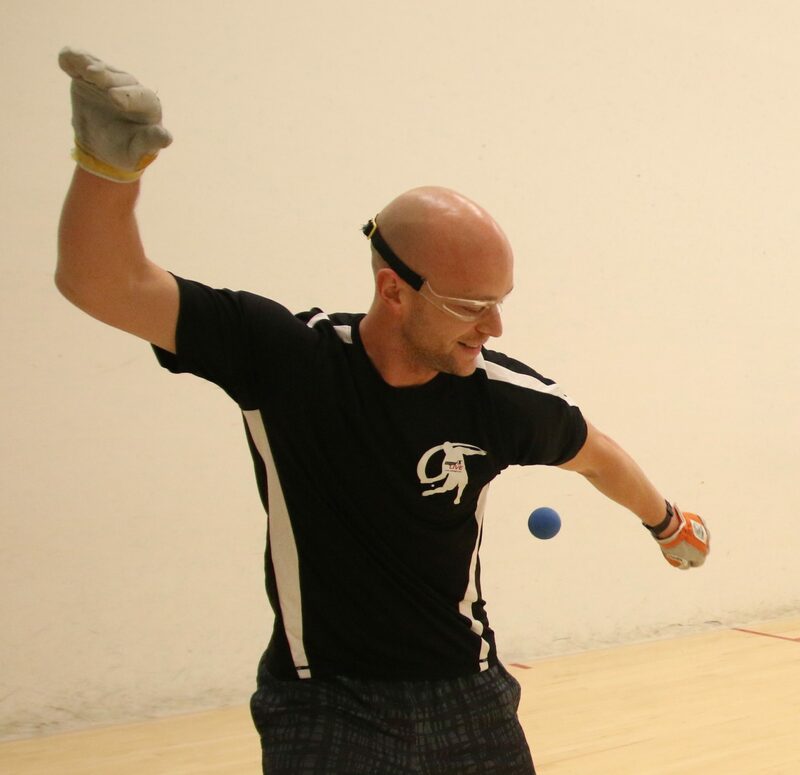 Lenning needed just 23 minutes to defeat the Olympic Club’s Erik Torres. Mando Ortiz dropped game one in his round of 16 match against Luis Cordova, but rallied to force a tiebreaker. Cordova appeared to be in control in the tiebreaker, leading 9-1 and appearing just minutes from advancing to his second quarterfinal of the season. Ortiz rallied, scoring 14 of the next 17 points of the match to stun Cordova. Ortiz will face perennial Elite 8 pro David Fink in the quarterfinals. 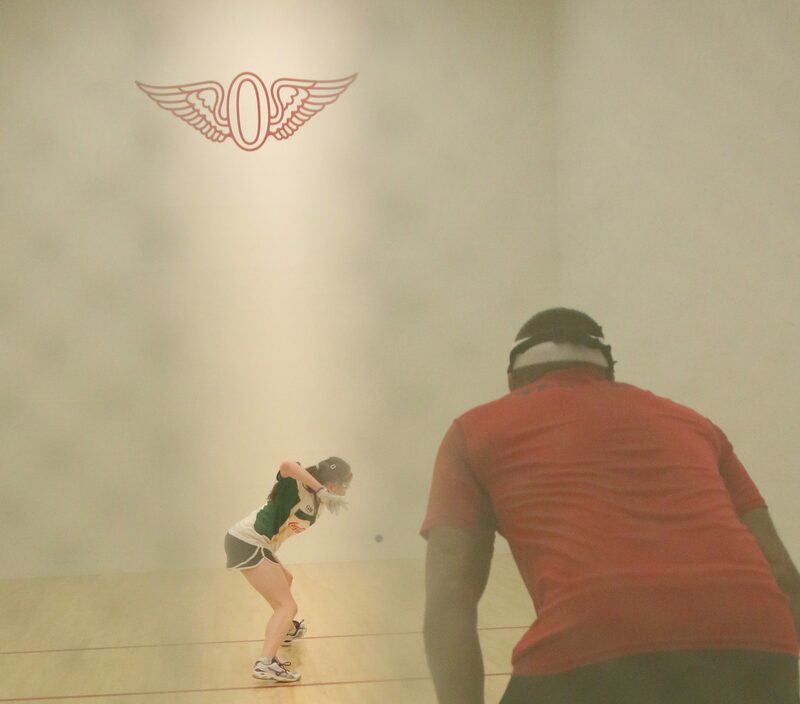 Fink defeated 10th ranked Stephen Cooney in two games in their round of 16 encounter. Emmett Peixoto survived a scare against Ireland’s #5 Senior star Martin Mulkerrins, overcoming an 11-12 first game deficit and back spasms while leading 14-12 in game two. Peixoto will face Lake Forest College’s Daniel Cordova in a rematch of their R48 IV Tucson clash. Cordova needed three games to overcome Elite 8 invite and former Lake Forest All-American Jon Iglesias. Cordova qualified for the first time in November of 2014 and has now advanced to the quarterfinals in consecutive events. Marcos Chavez also needed a tiebreaker to defeat Anthony Selestow in their round of 16 match to setup a quarterfinal clash with Luis Moreno. Moreno appeared to regain the form that saw him win nine Race titles in his first 18 Race starts, dismantling Vic Perez 15-2, 15-8. 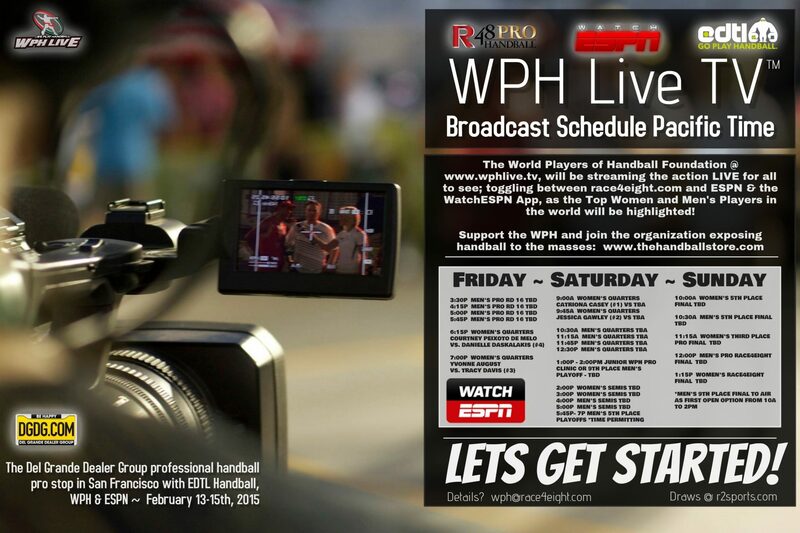 To watch live R48 and WR48 action on Saturday, February 14th, tune into the Watch ESPN App (http://espn.go.com/watchespn/). Play starts at 9 am pst. Don’t miss a point! To follow the live brackets and results from the event, click here: http://www.r2sports.com/tourney/home.asp?TID=13055. Additional viewing information (WPH All Access Pass Holders): wph@race4eight.com.